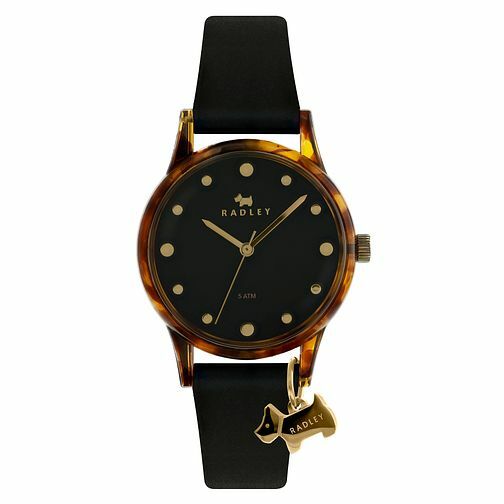 This Radley Watch It! ladies' 33mm case watch with a black silicone strap and black dial is the perfect out-going feminine statement. With gold tone dot hour markers and time hands, and an iconic Radley dog charm in gold tone, complimented perfectly by the tortoise shell case, this watch is cute and quirky, perfect for those fun weekend getaways. Radley 'Watch It!' Ladies' Black Silicone Strap Watch is rated 5.0 out of 5 by 1.